At Ray Lodge primary School we believe marking reassures and motivates children and adults alike in the pursuit of excellence in learning. It acts as a reward system, leading the child to understand the value of learning itself. A colour coded system of marking is used predominantly in KS2 and a visual code is used predominantly in KS1. Where appropriate we mark with the pupil present. Positive comments (green), both written and oral (OM) are used and pointers towards subsequent learning targets identified (orange) and where appropriate secretarial errors are highlighted (red). At the early stages of learning, much of the work is oral and therefore so too are the teachers’ comments. All work is marked daily and 2-3 written pieces per week are marked intensively using the three colour scheme. This may include writing through other subjects. In spelling, pupils are asked to spell correctly any words for which they have a resource (ie it is a key word on display). Such words are always targeted when marking, and if incorrect underlined and the correct spelling given/ asked for depending on age/ability of child. Gradually pupils are required to identify mistakes in their own work and encouraged to correct these using dictionaries. In handwriting activities, incorrect formation, joining, sizing and spacing of letters is underlined and samples given from which pupils can practise. Work is marked with the pupil present where possible and on occasions pupils self-mark. A variety of strategies are used according to the type of work being undertaken – written comments, correct work being ticked and incorrect work being dotted. Where appropriate, questions relating to the learning objective will be asked either orally or writing (Key Stage 2). The expectation is that children correct any errors made and therefore an appropriate amount is set aside for children to work on any errors/prompts for future learning. We consider it to be important for pupils to show their working in mathematics, as credit can be given to partly correct answers and insight, on the part of the teacher, can be gained as to the pupil’s thought process. For this reason, we encourage pupils to show working and carry out corrections without erasing their original answer. 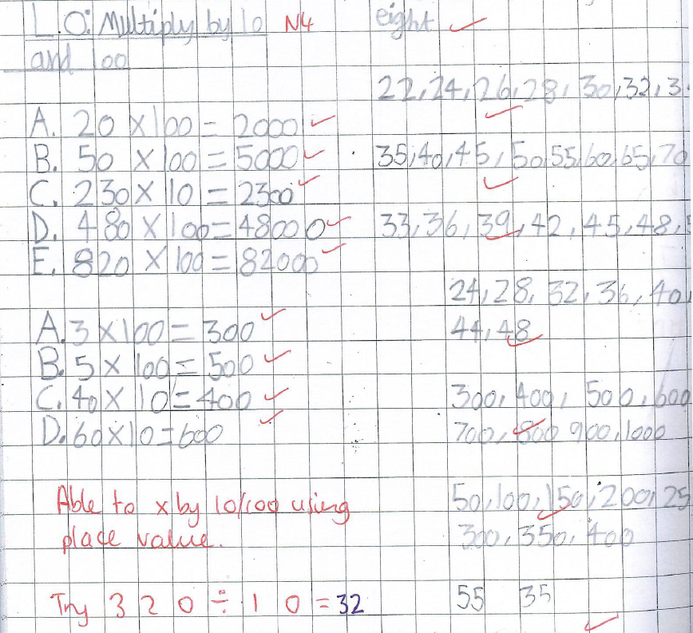 Pupils’ work is marked in red pen by the teacher and a sharp coloured pencil by the pupil. Non-core subjects are marked with due regard to the learning intentions. All work on display must be acknowledged and commented on in pencil by the class teacher. It is important that our marking is consistent. Written comments should reflect the school’s handwriting policy and presentation policy. Work should be marked daily. On occasions, pupil will peer mark and/or self mark. This is always seen by the class teacher (to inform future planning) and initialled. Reflection and review of the teachers’ marking by the pupils is very important, otherwise it negates the precious time the teacher has spent up on it, and does little to improve learning. ‘Fix It’ time happens in each class each morning and this is an opportunity for the children to reflect on teacher’s comments and suggestions. 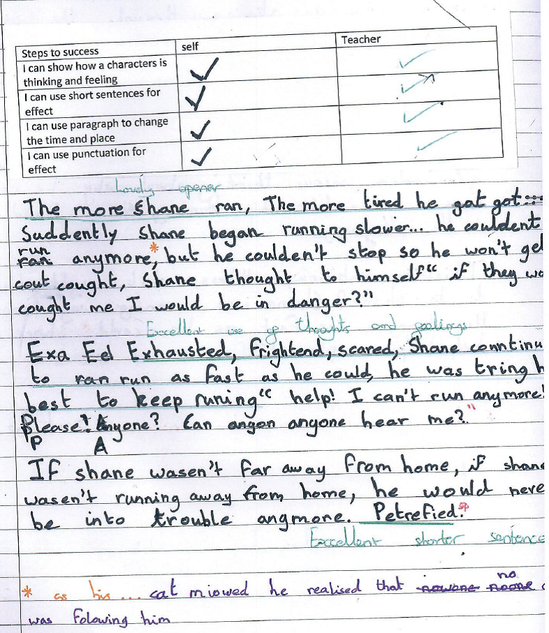 All ‘Fix-It’ marking is in purple pencil (Y1-2) and purple pen (KS2).